Many settlers from England proved to rank with the best citizens of Canada, although enduring terrible hardships; and probably because they endured terrible hardships. The journey made by the founders of Lloydminster on the Saskatchewan-Alberta border shows their courage. In 1903, The Laurier Government was enjoying a great immigration boom, thanks to an almost worldwide drive for new settlers. One of the immigration agents was the Reverend I. M. Barr, a silver-tongued orator in England. Anxious to earn the $5 paid for every head of family and the $2 for every person sent to Canada, he persuaded a large group of people that life in western Canada was better than in England. Their ship, an old tub called the Manitoba, arrived in Saint John on April 10, 1903, after a dreadful crossing. Men, women and children slept in the cargo holds. There was no privacy, the most primitive of toilet facilities, and the food and water were unfit to eat or drink. When they arrived in Saint John, they were loaded into “colonist cars.” The train was so slow it was said that the people in the front coaches could shoot a rabbit from a window, jump out, pick it up and get back on one of the coaches to the rear! 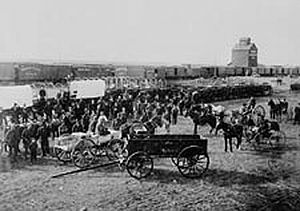 When they arrived at Saskatoon, they lived in tents for two weeks before journeying on. The wagons they travelled in were overloaded; baggage dropped into mud-holes and coal oil spilled into the food. The temperature was often below zero as blizzards gusted across the prairies. Many of those people were ordinary city-folk. Yet, they stuck it out. The colonists deposed Reverend Isaac Barr and replaced him with the Reverend George Lloyd. He encouraged the colonists, as shown by the founders of present day Lloydminster, which they named after him, because he did so much to keep them going. Do you want a visual? Just go to Canadian Museum of Civilization, where you will find a painting by C.N. Frey depicting this voyage. A great place to get a more detailed account, a good place would be at Lloydiminster.net . If you want to read not only about this, but about everything Canada and Canadian, I highly suggest reading The Oxford Companion to Canadian History. I find the immigrant stories to be very interesting and amazing the things that they faced. That $ 2 to $5 is that what you call head tax? This is great! I was looking for stuff about immigration during Laurier’s premiership and this will be really helpful. Keep up the good work.